The Players Club is open Sunday through Thursday, 8 AM to Midnight and Friday and Saturday, 8 AM to 1 AM. Receive an alcohol discount based on your tier when paying with cash! 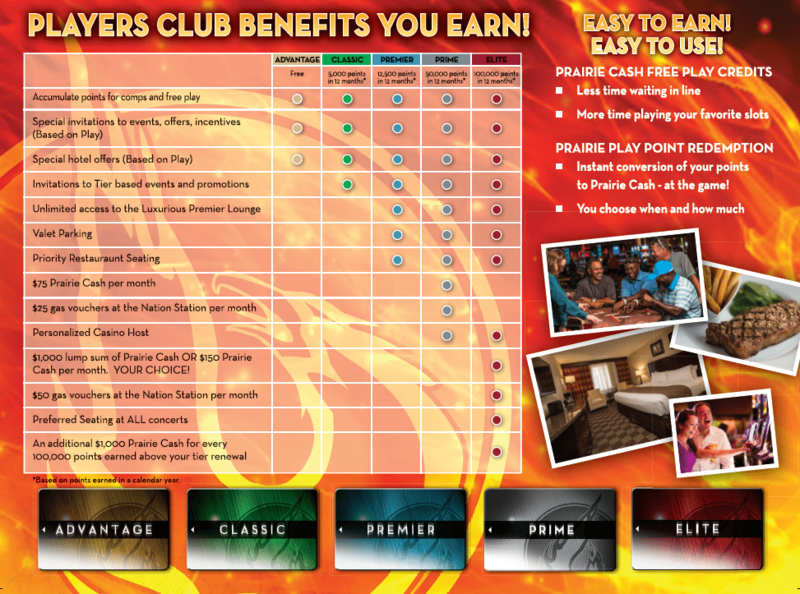 Stop by the Players Club with valid identification and sign up for your Players Club card. Points are earned on table play based on time played, game type, and average bet. Upgrade your Advantage-level Players card quickly by earning points. Points earned are based on a calendar year. Must have a Players Club card to enter all events. To verify your tier score please see one of the representatives at the Players Club. All benefits and offers based on availability. Management reserves all rights to cancel, modify or alter this program at any time. Player’s accounts must remain in good standing to receive Prairie Band Players Club Elite Member benefits. Individual member benefits can be canceled, modified or altered at any time by management. Prairie Band Players Club rules and guidelines apply. Certain restrictions and limits apply. Use of Prairie Band Players Club card indicates acceptance of the Prairie Band Players Club rules and regulations. Membership is FREE. Must be at least 18 years of age or older with valid identification. New Players Club members will select a 4-digit personal identification number (PIN) for the purpose of accessing free slot play.PIN numbers selected by Players Advantage Club members are to be used only by that member. The member should not disclose his or her PIN to another person or member for any reason.In the case of a forgotten PIN or a member requests to re-set the PIN, at least one form of acceptable identification (see below) must be presented.If a PIN is incorrectly entered more than 3 attempts, the player’s account is automatically locked and cannot access their Points or other benefits until the PIN is re-set at the Prairie Band Players Club. Prairie Band Players Club points and special offers are non-transferable unless otherwise noted. It is the players’ responsibility to ensure that the card is accepted in the reader when inserted in the slot machine. Casino is not responsible if player leaves card in machine unattended while pin is still activated. 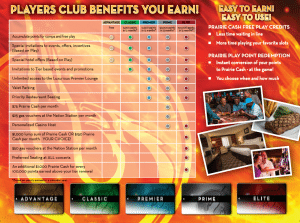 All Prairie Band Players Club benefits are based on level of play. Any misuse of the Prairie Band Players Club card or improper conduct determined by the Prairie Band Casino & Resort may result in cancellation of account and forfeiture of all Prairie Band Players Club benefits. Any unredeemed points will expire after 12 months of inactivity. Prairie Band Players Club members are not allowed to conduct transactions or obtain account information for other Prairie Band Players Club members. Management reserves the right to adjust any point or bonus balance resulting from malfunctioning, operator error and/or fraud. Prairie Band Casino & Resort reserves the right to cancel or modify the Prairie Band Players Club and its programs at any time without notice.